The Central Government has launched ‘Sovereign Gold Bonds Scheme‘ as an alternative to purchasing physical gold. 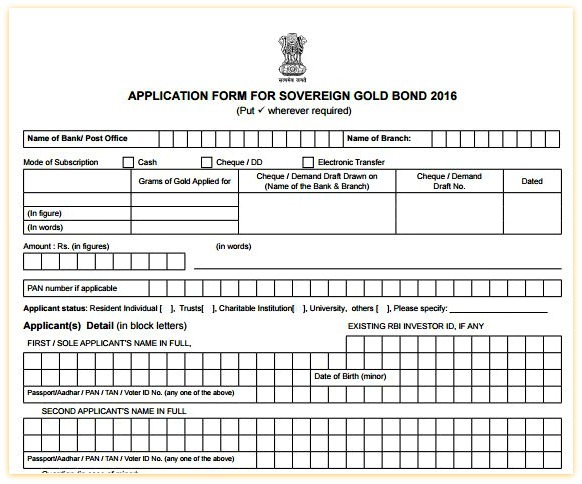 The application forms for subscribing to seventh tranche of Sovereign Gold Bonds issue are available from 27th February, 2017 to 3rd March, 2017. The bonds will be issued on 17th March, 2017. Sovereign Gold Bond Scheme is an indirect way of investing in Gold. Instead of buying Physical Gold, investors can invest in gold in a paper form through Sovereign Gold Bond Scheme. The under-lying asset for these bonds is Gold. These bonds will track the price of gold, plus an extra interest earning on top of that. Bonds will be issued on behalf of the Government of India by RBI (Reserve Bank of India). These will be marketed through Post Offices / Banks / NBFCs (Non-banking Finance Companies) and by various brokers/agents (including National Saving Certificate (NSC) agents). Gold Bonds can now be purchased from NSE and BSE, besides all Bank branches and select Post Offices. You have to provide the investment details. The minimum permissible investment will be 1 unit (i.e. 1 gram of gold) and the maximum buying limit is 500 gms per person per fiscal year. The issue price for sixth Tranche Gold Bonds (Oct to Nov 2016) has been fixed at Rs 3,007 per gram. However, the Govt has decided to issue the Gold bonds at a discounted price of Rs 2,957 per gram (a discount of Rs 50). You also have to provide the mode of payment (cash / cheque / electronic transfer. cash payment upto a maximum of Rs. 20,000). If you wish to hold the Sovereign Gold Bonds in ‘Demat‘ form, you have to provide your ‘depository participant’ details. Even if you subscribe to physical bonds, you can still convert them into demat form in future. If you wish to receive the interest payments & maturity payment (redemption payment) through electronic mode (direct credit to your bank account), you can provide your bank account details. In case the application is submitted by a Power of Attorney (POA) holder, please submit original POA for verification, along with an attested copy. Please note that nomination facility (maximum two nominees) is available to a Sole Holder or all the joint holders (investors) of an SGB. The nomination will be registered at the Office of Issue and a Certificate of Registration will be issued to the holder. The existing nomination can be cancelled or altered by a request to the Office of Issue. In case nominee is a minor, please indicate the date of birth of the minor and a guardian can be appointed. Nomination facility is not available in case the investment is on behalf of minor. In case of change of bank account, you can notify the change and get the details updated. You have to submit KYC documents along with the application form. The interest on the bond is paid half-yearly. The payment of Interest amounts will be done through the bank A/c provided in the Application form (or) to your bank A/c that is linked to the Dmat, as the case may be. Post maturity date, interest amount is not payable on gold bonds. The designated banks may soon provide online application facility too. You may also like reading my article – “Sovereign Gold Bonds Scheme – Features, FAQs & Review“. I have SGB in physical paper mode. how I can get it to demat form. I have already having demat account. Yes, you can convert your physical holdings into demat mode. All you need to do is to fill up the Dematerialisation Request form (DRF) and submit the physical certificate along with the form to your banker/intermediary. I subscribed for the sovereign gold bond through IDFC bank .I received the certificate through mail from RBI.i was unable to open that certificate.while I tried to open ,it was showing the error invalid file format unable to open .by using software ,can I open that certificate. Dear GOVINDARAJ ..It’s a technical issue, you may try downloading the file through some other system (or) take help of any tech guy. Else, you can contact your banker and get the prints of certificates by providing the Application numbers. SGB 2017 IV series allotted to me, applied through icicidirect demat. Dear Uma..Even I am not sure on this..You may check with ICICI direct customer care. In case, you get a correct reply from them, kindly update the details here, can be useful to other blog readers as well. Thank you! Hi, I have also applied for the SGB via ICICI bank online banking. The amount was debited on 17 Nov but till date bonds have not been credited in my Demat Account. ICICI has no clue about it. What can be done? Has anyone got the same in their Demat account? Is this a normal procedural delay or something to worry about? Dear Abhinav..For time being you can request the ICICI Bank to give a Printed copy of the Certificates. Dear Jaya..Kindly check with your banker. Did anyone get credit of Sovereign Gold Bond November 2016 tranche in DMAT? Date of allocation was 17th November. I still do not see in my dEmat account. Ok. Do post if you get in Demat . Sreekant, can you please help me if it has got creditted or it is going to take some time? Dear Kamlesh ..Kindly contact your Demat account provider/Banker. My question, did anyone get or have RBI released the allottment? Dear Kamlesh.. The bonds were supposed to be issued on 17th November, 2016. As of now, I do not have information if the bonds are issued or not. In case of application for bonds in demat form, does one need to fill in nomination form separately , or Nomination in Demat account will be operational for these bonds too. Dear Samir..IF the bonds are allotted to your Dmat account then the same nomination applies to bonds too. Timely discussion – I am thankful for the details ! Does someone know if my company could possibly obtain a fillable IN ECI-EPIC-002 document to use ? Dear narayanan ..You have to contact the concerned Depository participant (DP) and get them converted. i bought SGB through net banking, but not received any physical bond. afterward inquired in bank, they told i will get directly through post, i have not received. Bank has given me temporary certificate. what is the option to get my physical bond. Dear Vasudevan ..You can check with any online brokerage house. Hi, Same case with me.. Amount got debited on 5th Aug. but till date no communication or bonds in my Demat in ICICI Direct. I had applied from my ICICI SB netbanking. I have purchased gold bonds issue 3….the receipt says SGB II. till now i have not received any physical bonds..
My question is jow do i get the issue no. Rectified? Will i get any physical form/ paper bonds? Any idea about redemption process after 8 years? Dear Gaurav ..Did you apply for Physical certificates or in demat form? Kindly contact your banker/post office branch. You can just submit the certificates to the concerned bank/PO and the redemption price will be in Indian Rupees based on previous week’s (Monday-Friday) simple average of closing price of gold of 999 purity published by IBJA (Indian Bullion Jewelers Association). So, you would be receiving cash and not psychical gold on maturity date. Are you aware of the procedure for getting the Bonds in Demat once issued. HDFC Sec did not have any tick the box for selecting Demant. Further the Bank is not aware of the process for getting the bonds in certificate mode converted to demat. The bonds can be held in demat account by making a specific request for the same at the time of application.Till the process of dematerialization is completed, the bonds will be held in RBI’s books. The facility for conversion to demat will also be available subsequent to allotment of the bond. You need to get it done through your banker.As of now, I am also not aware of the exact conversion process. 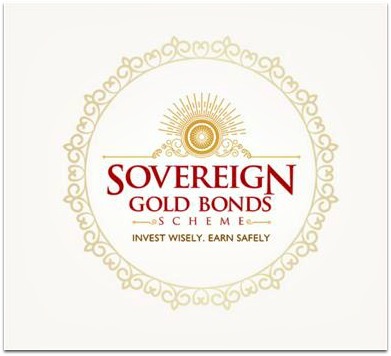 I have purchased some Soveriegn gold bonds in the February 2016 issue. Even though I recieved mail confirming allotment along with bond numbers., my Dmat account is yet to be credited. Has any one who purchased the bond got demat credit? Same here. Even I had applied Soveriegn gold bonds in the February 2016, allotment email received but the bond still did not get credited to demat account. My bank people (SBI) have no idea about this. 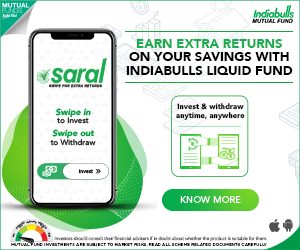 Did you receive SGB bonds in your demat account? Hi! Srikanth. I invested in gold bond Scheme on 22/01/2016. I also mentioned my mobile no. as well as e-mail id in my appreciation. Others who also applied for the same got both sms as well as mail intimating allotment of gold bond as applied for. But I have not received any such communication so far. Please let me know to whom I should approach to enquire about the position. Dear Mr Rao..You can contact your banker or Point of Service (POS). I have applied for Sovereign Gold Bond through HDFC Netbanking.I have also got the acknowledgement and netbanking reference number.Till now,I have paid nothing.I just want to know when will I need to pay to buy this actually or it will be automatically deducted from my account.Also,when I will get this bond issued. I believe that amount will be auto-deducted from your bank account. The Gold bonds will be issued on 8th February, 2016.
i had purchased gold bond via HDFC netbanking yesterday and also received an acknowledgement copy along with application number, but now for personal reason i intend to cancel the application, please suggest the process for the same. Already visited the HDFC branch and they suggested to get in touch with Customer Care as they do not have process of cancellation in place for this request, however spoke to customer care as well but they also do not have any idea about cancellation process for this and again suggested to visit the bank. Kindly suggest the cancellation process of this application or how to go about it. Dear Poman..Even I do not have any information regarding the cancellation process. You may have to follow up with your banker only. Did you issue cheque? Is it processed? I applied for Sovereign gold bonds of 5 Grams on 9th Nov 2015 through hdfc securities. but till now its not credited into my demat account. Please tell me what is reason for it. The Hdfc sec people are saying that the bonds are not allotted to any one till now. is it true. While submitting the application form, did you select ‘demat form’ as the mode of holding? I believe that the bonds (first issue) have been already issued. Hello Sreekanth… I placed the order online using HDFC Securities online demat account in IPO section. In satus its showing as “Executed”. But HDFC people r saying that the bonds are not alloted. Dear Shankaraiah..Kindly follow it up with your banker. Did you get the bonds credited to your DEMAT account? I am having same issue. The amount is deducted from bank but the bonds are not in my DEMAT account yet. I also applied for Sovereign Gold Bonds in November, 2015 through SBICAPSEC online purchase mode. The transaction has been executed and amount has been debited to my account. I have also received confirmation of allotment by e-mail with mail copy of the certificate. But till date, the bonds have not been credited to my SBICAPSEC account. Can you please guide me in this regard as to what I should do? Did anyone get the bonds deposited in their DEMAT account? For me as well they are not deposited though issued in Feb 2016. This case is Kotak Mahindra bank. Can I invest in Sovereign Gold Bonds now (in 2016) or is it closed? Unfortunately I missed the opportunity to invest in 2015. According to this RBI FAQ, people can invest in this scheme every year for a max of 500gm. I do not see application for this scheme available anywhere as of today. Can you kindly guide me regarding this. The first gold bond public issue was open for subscription in November. Govt may announce the dates of next issue soon. But as of now, no information about the next issue date. I have already applied for 15 grams of gold bond through a public service bank. Expecting high value for these bonds/gold after 8 years of maturity. Can you guide me how to invest in securities/bonds/Mutual funds..
i don’t know what all of these terms mean at the first place. But all i know is i can afford 5k for months for any kind of investment which yields good returns in the long run(even though returns are less i don’t mind but i don’t want to put myself in debt/loss situation)..
Where do i start with??????????????? If you have long-term goals, investing in equity oriented mutual funds can be very fruitful. 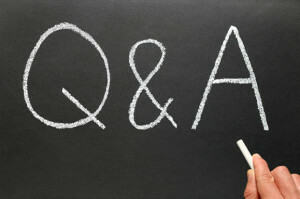 I have asked a few questions already to you and have always got amazing replies. This time my question is reagrding these gold bonds. Should I at age 23 invest in these bonds. I am investing in SIP already since past 6 months. If i decide to invest say something around 5-10 grams through this and with intrest of 2.75% and thinking that gold prices will b much higher 5 years down the line, should i indeed put money in this? Considering your age, it is prudent to invest the additional amount in your existing Equity oriented mutual funds. Do you see any pros / cons. Given the volatality of the market and other economic conditions it may be difficukt to understand if thegold price will be in upward trend in 5+ years. I was thinkingto put a considerable amount into the bonds please let me know your views. Investing in Gold is much riskier than investing in Equity related options. Also, over a long term, it may not beat inflation. You may review your decision to invest heavily in these bonds again. But,if you HAVE to invest in gold because of some goals (kid marriage etc) you may invest a small portion of your surplus money in these bonds. These bonds can be a better option than buying jewelry. Do note that they carry 5 year lock-in period. Thanks Sri. I agree on the perspective.